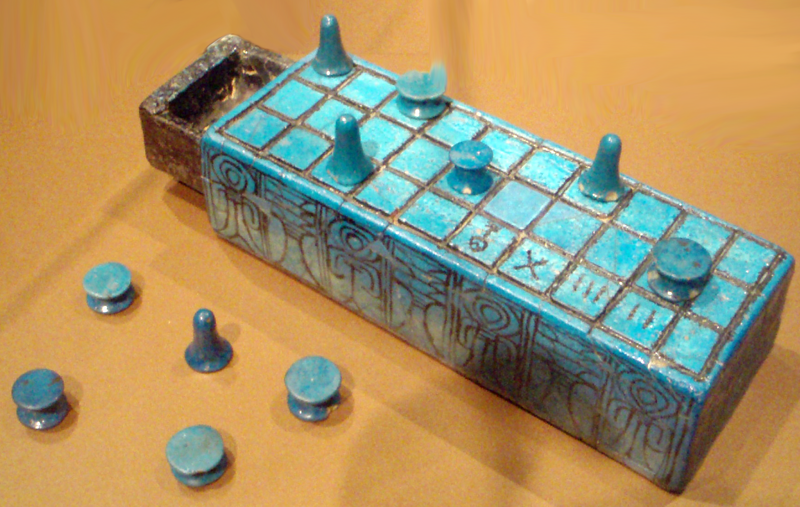 Senet board belonging to Amunhotep III. Image courtesy of wikimedia commons. O Praise to Isis, Queen of the Heavens, Mistress of the Nile. May your healing tears add to the flow of the mighty Nile. O Praise to Isis, whose father is Geb, the earth and whose mother is Nut, the sky, daughter of the union of land and celestial heavens. O Praise to Isis, daughter and son of the sun god, we stand together on the banks of the Nile and offer our homage to life-giving Ra. Thoth offers you greeting. It is a pleasure to stand alongside my sister goddess, resplendent in her beauty, and see her golden wings spread before me. Let me tell you, O sister, the tale of how you came into being; and my part in your creation. noted there were 50 distinclty name types of magic used to predict the future. For I am Thoth; the voice of Ra, Lord of divine body, he who measures out the heavens and stars, reckoner of times and seasons, author of word, wielder of magic and every branch of arcane knowledge, God of equilibrium and master of balance and he who understands everything under the heavenly vault. This tale relates my finest and proudest moment. For without it the world would never have seen the vision of beauty that is Isis nor have possession of her healing and protection. We must transport ourselves back to the time of creation when the cosmological deities were coming into being. Your mother, Nut, the sky goddess, was pregnant. But Ra, the lord of the sun, felt threatened by the prospect of rival deities. He had convinced himself his supremacy would be at risk if he allowed the procreation of more Gods and Goddesses. And so it was that Ra put a curse on Nut, preventing her from giving birth on any day of the year. Of course, at the beginning of time there were 360 days in the year and this decree meant Nut would remain forever barren and sterile. The Goddess of the sky was distraught and came to me for guidance and help, begging for me to intercede on her behalf. I was concerned by Ra’s judgement and Nut’s predicament, and knew my role as mediator between the gods proffered me the power to correct it. I needed to reflect carefully on how to act and decided to resort to the inner sanctum of my underground temple to contemplate the dilemma and seek wisdom. O my sister Isis, you have never seen my labyrinthine temple nor entered its inner sanctum, for even the Goddesses and Gods would get lost in it without my direction. I enter by a mighty pyramid and beyond that there is a circular labyrinth. It consists of winding paths, with walls and roofs constructed of gleaming white granite, which twist and turn. They are contained within one massive wall and the height of the passages is colossal. The twisting avenues are full of recesses containing golden statues of the Gods and Goddesses and the walls are inscribed with hieroglyphs, as is fitting for the temple dedicated to the scribe of the Gods. The pattern of the labyrinth is of itself not complex. It forms one intertwining pathway into its inner core and then out again. Yet its twisting route and vast scale are confusing for those who follow its paths. I have known those who have not followed the path in the right spirit lose their minds as they become overwhelmed by the massive walls and confused by the rows of hieroglyphs, even though the route is one pathway and logical. Even those who seek to follow the path with a true heart and spirit will find themselves disorientated. They will wander its twisting route unsure of where they are or whether the path has any end, or whether they will become lost and never find a way out. Those with faith will find the centre. For at the core of the labyrinth is a colossal circular chamber. In its centre is a statue of Ra standing astride the Seket boat with the god Ma’at and myself by his side, his guides and protectors, ready to follow its river path into the underworld. For most of those who enter the temple, this is as far as they will go. They will admire the scale and beauty of the labyrinth’s inner chamber and continue on the winding paths until they return to its entrance. Those who enter in the right spirit will emerge disorientated, but in a state of calm contemplation. They will have been touched by the magic of the Gods and rewarded with knowledge and understanding. But in the central chamber there is a secret entrance to a lower level. There is a portal in the carved floor of the boat invisible to the naked eye, which can only be opened by a spell. When you descend below the circular labyrinth to the lower level there is another series of passages and chambers. There are 1,500 rooms to the north representing the moon and another 1,500 rooms to the south representing the sun; a total of 3,000 secret chambers, all connected by an intricate and bewildering network of passages and gates. Many of these require spells or secret passwords to pass, whilst others are set with booby-traps. Why does this elaborate labyrinth exist? Well, it’s to protect Thoth’s inner sanctum -– the place where all knowledge is held. For it is here I keep all my writings on the art of magic, spell-weaving, the movements of celestial bodies, and the rituals for the judgement of the dead. This was my place of resort to ponder whether I should take action against the curse Ra had placed on Nut. I sat in my library surrounded by stone shelves lined with rows and rows of papyrus scrolls containing every element of arcane knowledge existing in the world. As Thoth, he who judges between good and evil and he who is invested with the power to mediate between the Gods and Goddesses, I knew it was within my power to act to reverse Ra’s decision. And as one who has stood alongside Ra and Ma’at, it is my role to bring balance to the world. In my judgement, it was necessary for the new deities in Nut’s womb to be born to bring harmony to the world. But how should I do that? I set down my staff and ankh and scoured the papyrus scrolls for spells and incantations to reverse Ra’s curse, but found none of them to be strong enough to overturn the judgement of the sun God himself. Then, a brilliant thought struck me. Perhaps I did not have to undo Ra’s spell, only to by-pass it to achieve my goal? I hunted for the spell I needed to summon the Moon into my presence. I soon found what I needed, picking out a papyrus scroll from amongst the many thousands in my chamber, wherein the font of all knowledge resides. I unrolled it and read its lines of hieroglyphs. I selected earthenware bowls and glass vials from the shelves and prepared the magical unction I needed. I lit the incense so my inner sanctum smelt of lotus flowers. Then I read the invocation. Praise be to Khonsu, God of the Moon. O mighty God who commands the lunar cycles I give greeting. O Khonsu, I beg your forgiveness for interrupting your journey across the skies, spreading your mystical light across the world. Pathfinder, defender and God of the light of the night, your fellow moon god, Thoth, summons you to attend. Khonsu, the God of the Moon, obeyed his summons and appeared before me. He descended down from the skies transformed into his falcon headed human form, the full moon disc on his head. “I was bored and felt like a game,” I said not wanting to reveal my true intent in case he sided with Ra against me. “You have summoned me here for entertainment!” The God was indignant. I knew he would join my game. It is lonely traversing the sky every night without any company and I guessed he would be grateful for a break, some conversation and entertainment. I set out the board for a game. My senet board is a beautiful object. Its squares are made of ivory, its borders decorated in turquoise and red faience and its pieces elaborately carved in the shape of seven red and seven white lions. I produced the wooden dice inlaid with dots of glittering gold, and we began to play. Two gods hunched over a board, gambling on the lives of new Gods and Goddesses, not that I had revealed that to Khnonsu. I say, without modesty, that I am an expert in the strategy of senet; it is one of my special areas of knowledge amongst many others. It was fun to pit my wits against another god, but the result was never in doubt. When I was victor I claimed my prize from the God of the Moon -– a 72nd of his light. The five days that I needed. He was disappointed at not having won my crescent moon disc, but thanked me for the game, and I bid him farewell so he could continue his passage across the sky. I left my the inner sanctum of all knowledge, snaked my way through the labyrinth of passages that protected it, and emerged through the portal in the bottom of the boat carving into the centre of the circular labyrinth. I sought Nut out. I knew where to find her. She was naked and arched over the earth, her body decorated with a star-filled sky with her fingers and toes splayed to touch the four cardinal points of north, south, east and west. She was still distraught at Ra’s decree that she could not give birth on any of the days of the year. She was pleased to see me and she was thrilled when I explained how I had devised a way to by-pass Ra’s curse. On the five days that I had won off Khnonsu she gave birth to new Gods and Goddesses –- to you, my beloved Isis, and to, Osiris, Set, Nephthys and Horus. And forever more the year now consists of 365 days. Ra was furious. He was angry with Nut and declared she must forever be separated from her husband, Geb, but, having given birth to her children that was of no serious concern to her. Ra was angry with me, too. But my place is to act as mediator between the Gods, and I was confident I’d made the right decision. Ra is too jealous. It was right and fitting that the new deities be born to take up their place in the pantheon of Egypt. He got over it, and when he decided to retire from this earth he still left me to dispense just punishments on the dead before they passed into the underworld. So, there we are, O beautiful Queen of the Heavens. That it is how your mother came to give birth to you, and Thoth’s part in it.